Introduction: Pancreaticobiliary anomalies are rare; interpreting their significance is a challenge. This study correlates these unusual anomalies with various biliary and pancreatic diseases, complications and treatment options. 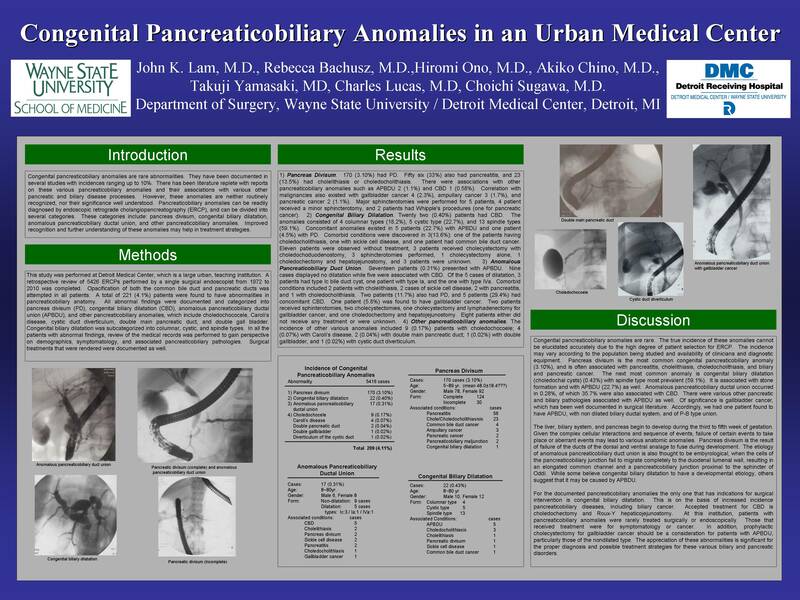 Methods: Pancreaticobiliary anomalies were reviewed at an urban medical center from 1972 to 2010. During this time interval 5426 patients ages ranging between 5 years old to 90 years old underwent endoscopic retrograde cholangiopancreatography (ERCP) performed by a single surgical endoscopist. The records, imaging studies, and outcome were retrospectively reviewed. Results: Pancreatobiliary anomalies included: 1) pancreas divisum (PD) in 170 (3.1%) patients (56 (33%) also had pancreatitis, and 23 (13.5%) had cholelithiasis or choledocholithiasis), 2) congenital biliary dilatation (CBD) in 24 (0.44%) patients, 3) anomalous pancreaticobiliary ductal union (APBDU) in 17 patients (0.31%), 4) choledochocele in 11 (0.20%) patients, 5) Caroli’s disease in 4 (0.07%) patients, 6) double main pancreatic duct and abnormal cystic duct origin in 2 (0.04%) patients each, 7) double gallbladder in 1 (0.02%) patient, and cystic duct diverticulum, annular pancreas in 1 (0.02%) patients for each. Pancreas divisum was associated with pancreatitis in 33% of patients, and 13.5% of them were associated with cholelithiasis, and choledocholithiasis which were treated as appropriate. Asymptomatic PD was followed. Other anomalies requiring surgical or endoscopic treatment such as cholecystectomy, sphincterotomy or stent placement included CBD, APBDU and choledochocele. Conclusion: Pancreaticobiliary anomalies are rare. Surgical or endoscopic treatment is required for symptomatic and in patients with choledochoceles. Asymptomatic patients with anomalous pancreaticobiliary ductal union should be followed for subsequent malignancy. The appreciation of these abnormalities is significant for the proper diagnosis and possible treatment strategies for these rare biliary and pancreatic disorders.